We are feeling SO deeply inspired by this week’s incredible workshops and events for our NJ yoga family. From the beautifully created Women’s Healing Circle at Align Amar, to Family Yoga with Robin Schumer at Honor Yoga North Brunswick, we feel like there is absolutely something special for every single yogi – regardless of age, shape, and/or size. We highly recommend doing some GOOD this week too, a la Malas on a Mission, to benefit the Brodie Fund at Langosta Lounge, Asbury Park on february 5, 2019. Malas on a Mission is a partnership between Marilyn Schlossbach, Executive Chef, Environmentalist, Community Activist and Krista Lynn, Jewelry Designer and Spiritual Workshop Facilitator. Going on our 5th year, our Mission is giving the gift of good intention to people as well as local charities. Join us for a night of creative beading, inspiration, ocean views, amazing food and drinks led by Krista Lynn of Krista Lynn Designs. You will learn about the charity of the night, the Mala Necklace, and tap into your creativity making yourself the gift of good intention. Truly is a wonderful night of Community and Giving Back. You will leave with your very own Mala Necklace to simply use for wear or prayer. We also want to make sure you grabbed a ticket for our Self-Care Sunday Mini-Retreat on February 24, 2019 at Honor Yoga North Brunswick. It is a wonderful gift to give YOURSELF this V-Day; a way to celebrate your own amazing journey on and off the mat. We hope to see you there! Celebrate Valentine’s Day and make it a date night with your loved one, a friend or with yourself! Come experience the art of relaxation by candlelight! Restorative Yoga features nurturing yoga postures, through the use of props, to create deep states of relaxation, ease and health. This class is designed to help you learn to relax and rest deeply and completely! During deep relaxation, all the organ systems of the body are benefited and your spine is aligned. Essential Oils naturally compliment this class and are used to enhance pranayama (breathing techniques), meditation, and relaxation. Postures and oils come together to activate and balance the energy centers of the body. Experience the relaxing qualities of yin yoga with the healing effects of acupuncture in a safe, calm environment. 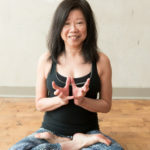 Join Brassy Buddha in a unique 60-minute workshop focused on relieving the body and mind from the stress & tension experienced in everyday life. You will be guided through a gentle yin class to help relieve stress and then finish off with an acupuncture assisted Savasana to enhance relaxation and optimize energy flow through the body. You’ll leave feeling calm, balance & restored. This is a great opportunity for those wanting to experience acupuncture for the first time. No experience necessary. First timers are highly encouraged. Pre-registration is required. Spaces are limited, so make sure you call or email us to reserve your spot! Please join us for a very special mother/daughter Valentine’s workshop where Krista Lynn will guide you through a wonderful spiritual and intuitive event where you make your own Mala Beads. The Mala is a strand of beads traditionally used for counting during meditations. Today, many people wear their Mala as a necklace or bracelet as a reminder of their personal and spiritual intentions. A body-mind centering exploration drawing from yoga asanas and authentic movement improvisation, with a focus on organ awareness and detoxification. Join this interactive experience, learn a bit about organ awareness, and move primitively in a safe space. Help celebrate this day of love with the kids by practicing partner yoga poses together. Don’t miss this amazing opportunity to experience the joy of yoga and Valentine’s Day arts and crafts. Yoga mats and all art supplies provided. Learn fun partner yoga poses from the Therapeutic Acroyoga tradition, followed by a deeply relaxing partner Thai Massage, where participants will take turns giving and receiving. You will come away with techniques you can share with friends and loved ones. In this beautiful candle-lit 90 minute class, you will explore deep relaxation techniques. This practice offers fully prop-supported poses with meditative techniques that will arouse the senses. Aromatherapy with 100% pure essential oils is interwoven throughout and combined with chocolate tasting. Each scent and pose are carefully paired to enhance the qualities of each. Cindy will lead this peace & love themed class in honor of Valentine’s Day. The perfect Valentine date! Let’s practice kundalini yoga with its powerful breathing exercises in a space that enhances your breathing experience – the salt cave! Kundalini Yoga is a practice that tunes up your entire system – body, mind, and spirit. It can strengthen the nervous system, purify the blood, and balance the glandular system. It powers up the navel center and strengthens the entire body while increasing flexibility. The exercises in kundalini yoga can charge up your metabolism to help with weight loss. What a great way to experience yoga as a family and spend time together! Spend time bonding while doing something healthy and fun. Music, games, and partner poses are the focus, followed by the grand finale of scented foot massage and yoga nidra. In this workshop, we’ll begin by discussing what is represented at each chakra and which asanas specifically awaken and move energy at each level to work towards balance. We will complete this chakra based experience with an asana practice that will include mantra and meditation. You will leave this practice feeling balanced, centered and connected to spirit. Make Your Singing Bowl Sing! How do you play a singing bowl anyway? Come for a fun, relaxing and informative class to learn how to play a singing bowl and use it in your life. There will also be a short, guided meditation. Acupressure is one of the natural body healing practices that originated in China several thousand years ago. It is being practiced ever since by trained practitioners and monks. Acupressure is believed to balance the flow of life energy (Chi/Qi in Chinese and Prana in Sanskrit) through natural transport channels or meridians in our body. Gentle fingertip pressure is applied on certain points located on these meridians to relieve blockage and restore energy flow. This technique not only offers relief from pain, trauma, stress and burnout but may also improve the functioning of internal organs. Acupressure therapy is very effective in resolving many conditions that are byproducts of our day to day living. Be Connected. Be Mindful. Be Empowered. A mini-retreat for women to network, move, learn, eat /drink and set a clear path for 2019. Start the New Year right with experts who will share simple, implementable tips and tools for taking care of yourself first! Develop an approachable and efficient yet effective yoga/movement home practice under the guidance of Shefali, a certified yoga instructor. Find foods that work for you with Sharon Vecchiarelli’s amazingly simple, delicious and nutritious recipes. Create your career goals for 2019 by living your life by design rather than default with Priya Gopal who is an executive coach. Meet a fantastic group of women while sipping a glass of wine on a cold Sunday afternoon! Gather with like-minded women to hold the space for spiritual growth. In this beautifully curated workshop, there is meditation, gentle flow, and a set of exercises to strengthen the immune system. Leave connected to your Life Force Energy, as well as your own inner light.